Just a heads up, but update schedules may be in flux in the near future. My 9-5 contract job is over and I start a part-time job next week, no idea yet what the schedule will be like. I’ll keep you all in the loop re: updates as I can. Oh, and if you missed it in last strip’s comments, DSHigsby made a Selkie TF2 spray to promote spy-ness. Fun stuff, thank you! It helps to speak dialogue aloud when writing. For example, Brown's last piece of dialogue was originally going to be "Accidents are just infant incidents". Infant Incident is a bit tongue-twistery to say aloud, so I went with new-born. Maybe it's because I am writing this at 3am, but I can't stop saying it to myself now. Miss Ellen’s belly-button! GASP! I didn’t know this comic was explicit! I do believe I’ve succumb to the vapors. 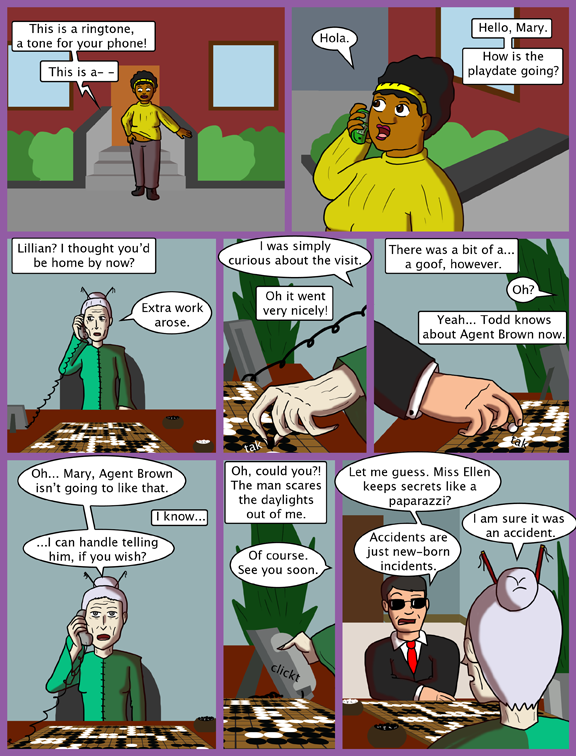 I’m not surprised that Lillian plays go, though I am somewhat surprised that Agent Brown does. It feels a bit unnatural at first, but it eventually becomes second nature (and it’s genuinely easier to place a stone that way if the board is crowded). This page has more details. Also, I don’t know how you drew the board, but you might want to consider doing what the authors of the manga/anime series “Hikaru no Go” did, and use real games. For instance, real games virtually never have clumps of stones that aren’t surrounded by opposing stones, as in the lower left of the board (from panel 3’s perspective). Like, photographs of real games? Because I considered that but I don’t generally like the patchworked look that gives. Not photographs, just board layouts. That way the game looks more natural. You’d still draw it the way you do now, but with the stones in different places. Maybe you’re thinking that if the index finger is under, then the thumb is over? No — the middle finger is over, and the stone is held against the nail of the index finger. What was my point again…? I’m not sure, but I’m with Dave in repeating “infant incidents” and giggling. Might be the fact I only slept 4 hours last night. I haven’t played TF2 in a while now that I think about it. My favorite classes are Heavy Pyro and Engineer, though. Mostly Pyro (Do you believe in magic?). ahhaha yes I do. I’m more medic/ sniper/ spy……… yes you can make spy Vs. spy jokes at me! shhhhhh don’t tell them that shes got her scout look up! I’m pretty sure “paparazzi” is a plural term. “Paparazzo” is the singular. Does Agent Brown have a band of renown? The question is: What kind of Agent is Agent Brown? An MiB Agent, or a Matrix Agent? (The three Agents in The Matrix were Agents Smith, Jones, and Brown. Brown was the Big Agent). 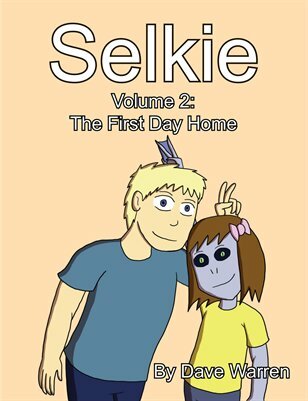 I have been saying it all along that Selkie is a deep-one and Agent Brown works for the special services branch of the New Earth Government aka the Freak squad. When something goes bump in the night when a cultest summon other worldly creatures he is there to reel them in.